Welcome to Sole Food, a review segment on finding the best shoes for your dance needs. Depending on your dance style, costuming, and venue, you need to find the right shoe for the job. Like any costume element, make sure to practice in your shoes before hitting the stage. What is it? Ever wonder why your feet hurt after a night of dancing in heels? That’s because regular high heels aren’t made for dancing! 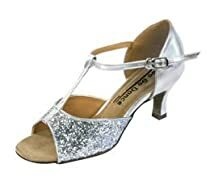 Ballroom/Social dance shoes are specially manufactured for a dancer’s needs and include reinforced arches and heels as well as flexible suede soles. What’s it made of? Leather, suede, synthetics, plastics, etc. What kind of dancers will wear it? A beautiful pair of ballroom dance shoes is like the icing on the cake for a gorgeous cabaret-style costume. Egyptian and Turkish style dancers take notice! Most ballroom shoes come in black, tan, cream, gold and silver, but there are even prints and other special fabrics. You can even customize your shoes by gluing on rhinestones. Who makes it? Brands include Capezio, Sansha, Veryfine, Featherlite, GoGo, Bloch and more. Different brands have slightly different widths and styling. Custom shoes are available from some manufacturers. Capezio Brazil has also partnered with the belly dancer Esmeralda to create a high-heeled shoe specifically meant for belly dance, though the word is still out as to whether they really differ from conventional ballroom shoes. Sizing tips? Ballroom shoes often run smaller than street shoes, and some dancers even prefer to wear them several sizes smaller than their usual size. Make sure to consult the manufacturer’s sizing chart, or try on a pair before purchasing. Different styles (flared, Cuban) and heights of heels are also available; I like a 2.5″ flared heel.